At Active Home Care, we offer exceptional elderly care services to Surfside and its surrounding areas. Choose any aspect of our service you need and we’ll develop a personalized plan for you or your elderly loved ones. This gives you the compassionate care you need while allowing all family members to have peace of mind. We offer dedicated live-in care services for seniors and families who require a caregiver on a 24/7 basis. This is an excellent option for families or seniors who need higher care but want to keep living in their homes. A caregiver will always be available to cater to the needs of your loved one at night. 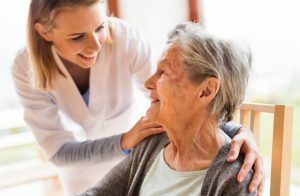 This type of care is ideal for seniors who have special needs related to Parkinson’s, Alzheimer’s or dementia, which require close monitoring and help with mobility. Why Is Our Senior Care in Surfside the Best for Your Loved One? Our carefully managed team of caregivers offers seniors all the assistance they need while they enjoy living in the comfort of their homes. We match the best caregivers to the needs and temperament of your elderly loved ones. Our caregivers adapt to your needs and schedule so you can enjoy our service just when you need it. There’s no minimum number of hours required to utilize our service. We know what it means to be lonely and isolated. That’s why we designed a thoughtful and compassionate program to provide much-needed companionship for seniors living alone. With Active Home Care, independent seniors have adequate help for their daily activities. In addition to companionship, this service offers help with errands, shopping and household chores. Seniors and families that choose our companion care service don’t have to worry about the emotional effects of isolation anymore. We’d like to discuss your elderly care needs and develop a personalized program that meets your requirements. Take the next step and contact Active Home Care today.